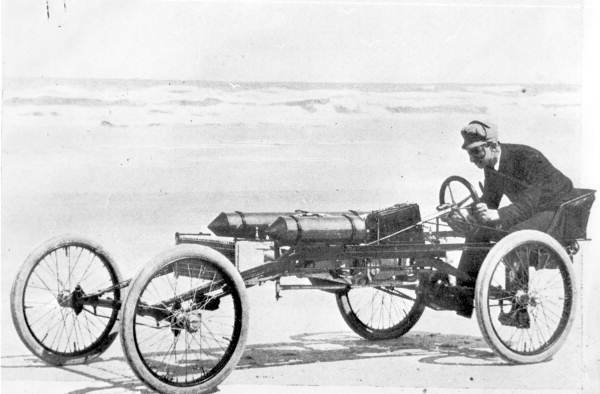 Ransom E. Olds in the Olds Pirate racing car at Ormond Beach, Florida in 1896 or 1897. Ransom E. Olds in the Olds Pirate racing car at Ormond Beach, Florida in 1896 or 1897. Visitors at Ormond hotel discussed the idea of an auto race on the beach. Alexander Winton had already built and driven a race car called the Bullet while Ranson E. Olds was manufacturing small two seaters and had sold a sightseeing bus in Ormond. Winton agreed to bring his car down and Olds said that he would build a suitable challenger. The two cars met and had identical speeds of 57 mph. It was fine sport and neither claimed victory. Image RansomEliOldsOldsPirate.jpg in the public domain and available on the Wikimedia Commons.